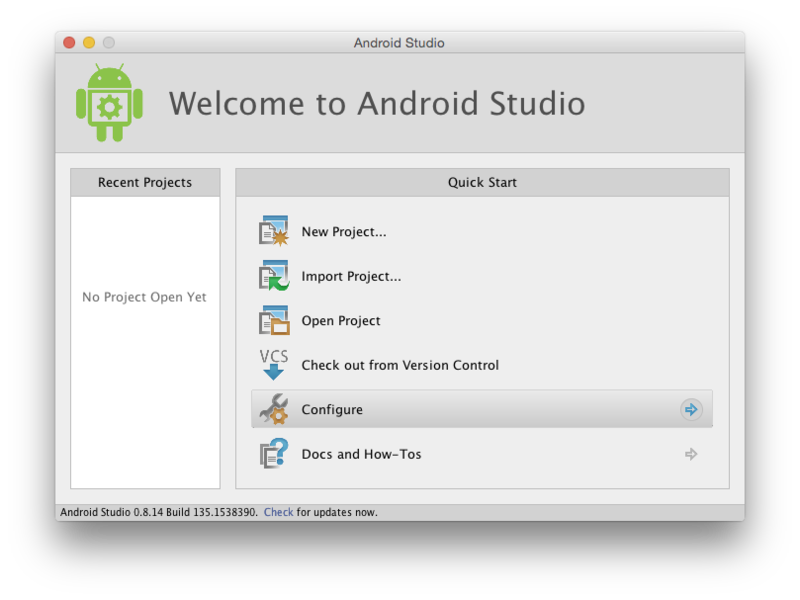 I just downloaded the Android Studio .dmg for OSX. Per the installation instructions, I've dragged it to the application folder and launched the application. But the SDK Manager and AVD Manager are greyed out and are impossible to use. Any ideas on an installation step I may have missed? For people coming for this same problem for Windows: you won't have an Android SDK anywhere if it is your first time with Android. 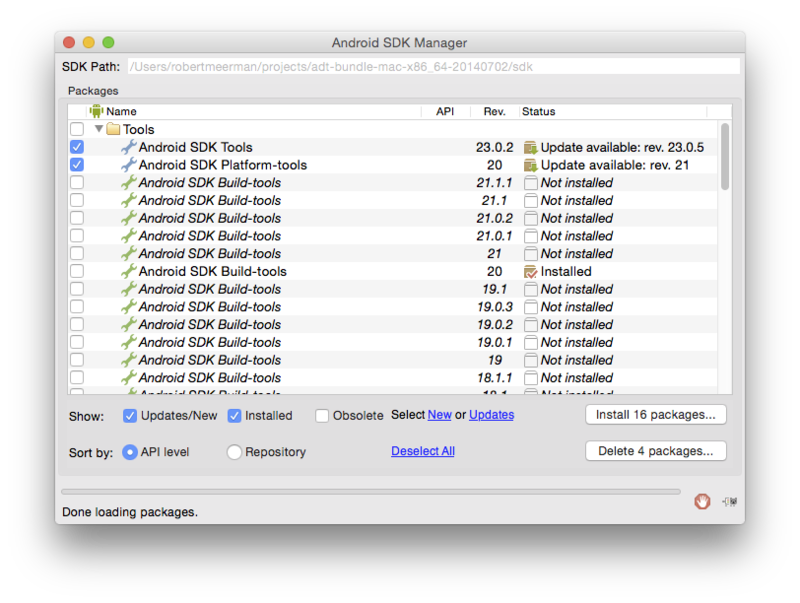 Also, here the Android Studio doesn't come with a packed SDK Manager, so you need to download one. Download the SDK Manager from: http://developer.android.com/sdk/. Use the link that says "Get the SDK for an existing IDE". Download the proposed SDK (if you get errors regarding the SDK Manager couldn't create some folders, remember it should be executed as administrator). Open Android Studio and in the Quick Start window click "Configure", you will see the SDK Manager greyed out. Go to "Project Defaults", then to "Project Structure" and there it will ask for the path where you installed the SDK. If you click OK and go back you will see the SDK Manager is no longer greyed out, and now you can start creating projects. A project needs to have been loaded at least once for the link to become available. 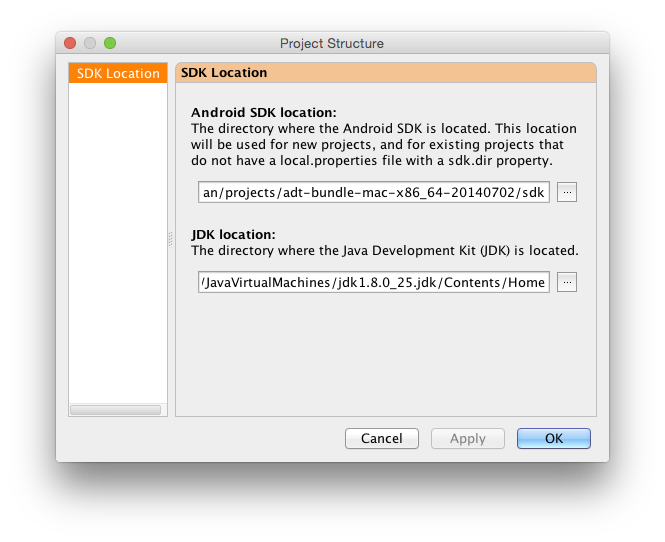 Found it in : File / Project Structure... Then in "Android SDK" provide the path to the SDK folder inside the Android Studio Application Bundle. Then Make a new project. Then after the initial setup the elements where finally enabled. 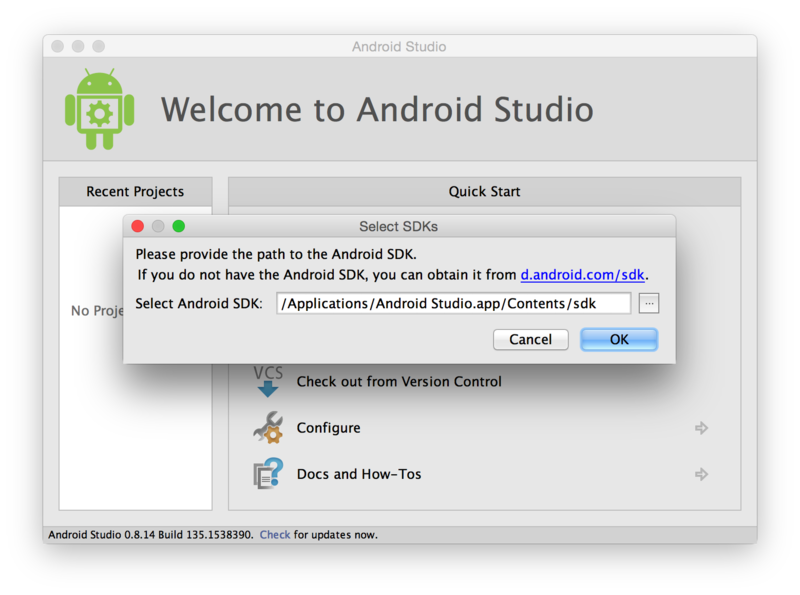 Android Studio Beta v0.8.14 with the Android SDK for Mac does not appear to include the SDK: you need to install the SDK manually (e.g. https://developer.android.com/sdk/installing/index.html?pkg=tools) and then configure Android Studio to find and use it. I had a similar problem and the cause was that I've used path with a space in it. There was a warning in the window that can cause problems with NDK, but in fact it caused problems with Android Studio internal SDK as well. After changing the path it works fine. give the path for the SDK and press OK. The SDK or SDK manager is not included with this version of Android Studio, and the documentation is obfuscated regarding this change at this point. Download the standalone SDK from here. You may select the latest revision of the same from this link below the title GET THE SDK FOR AN EXISTING IDE. This will no longer be a problem when version 1.0 is released. In the meanwhile you can download the latest canary build (1.0 RC2), which downloads the SDK during the setup. I hope this solves the problem of grey out area. Not the answer you're looking for? Browse other questions tagged android android-studio android-sdk-tools or ask your own question. How to install Android Marshmallow on Android Studio?